The Amstel House garden looked very different in the 1700s. 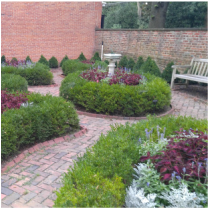 Today's garden was designed as a Colonial Revival garden in the 1930s by Charles Gillette, a highly regarded Virginia landscape architect. Click here to learn more about exciting changes to the Amstel House garden! The Amstel House Garden is free and open daily from sunrise to sunset. Use your smart phone or tablet to guide you through this tour, or print this page to take with you. Contact us for information on scheduling an in-depth docent-led tour. Enter the garden through the wooden door on East 4th Street to the right of the historic Amstel House, pausing to admire the door (temporarily removed from its frame) and its hardware, designed by Charles Gillette in the 1930s as part of his Colonial Revival plan for the garden. Then take a few steps on the herringbone brick path also designed by Gillette. 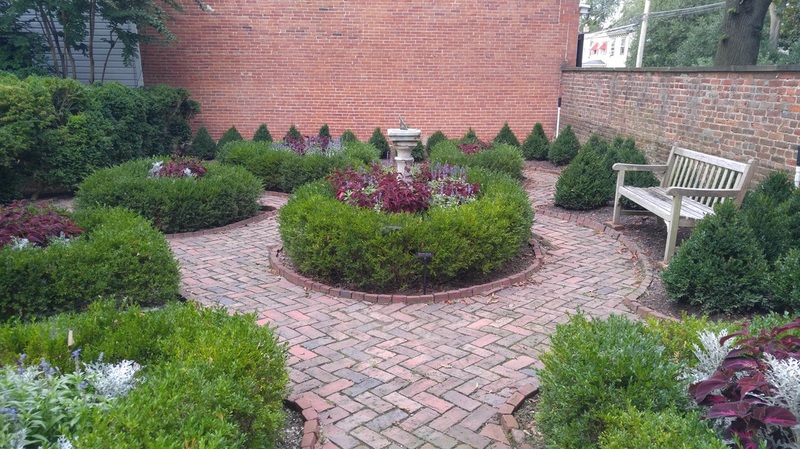 Turn right to enter the boxwood garden, one of the hallmarks of Charles Gillette's Colonial Revival design. This is a parterre garden: a formal ornamental garden with an intricate pattern of plant material edged with hedging and paths. From a bird's-eye view, the paths form the shape of a butterfly. The focal point of this garden, as designed by Gillette, is the sundial in the center atop a pedestal. The circa 1789 English sundial sits on a baluster: a short pillar to support a handrail. The baluster was reclaimed from a Renaissance-era section of London Bridge that was dismantled in 1730. 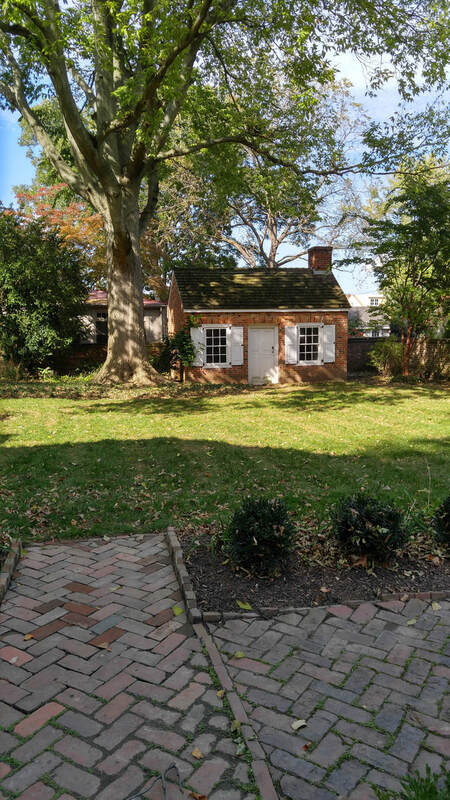 In the rear of the garden is a delightful garden house, designed by local architect Victorine Homsey as a facsimile of a Virginian Georgian tool house. It was built in 1938 using beams and windows from an old building in Chester County. Step inside to see copies of some of Gillette's drawings and compare them with the garden today. View other photographs and documents to learn more about the history of this lovely garden. 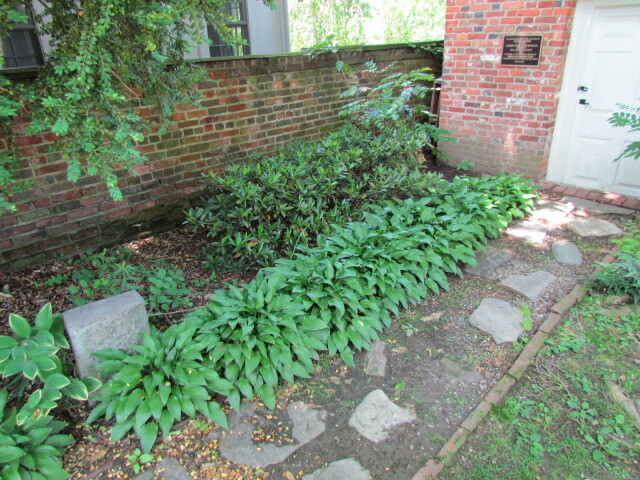 The stepping stones on the left side of the garden house came from the homes of signers of the Declaration of Independence and other notable patriots from each of the 13 original colonies. The hackberry tree in front of the Path to Independence was planted in the 1930s to replace a large walnut tree that was struck by lightening. Hackberry trees are related to elms and typically reach 40'-80' in height. This is one of Delaware's largest specimens. 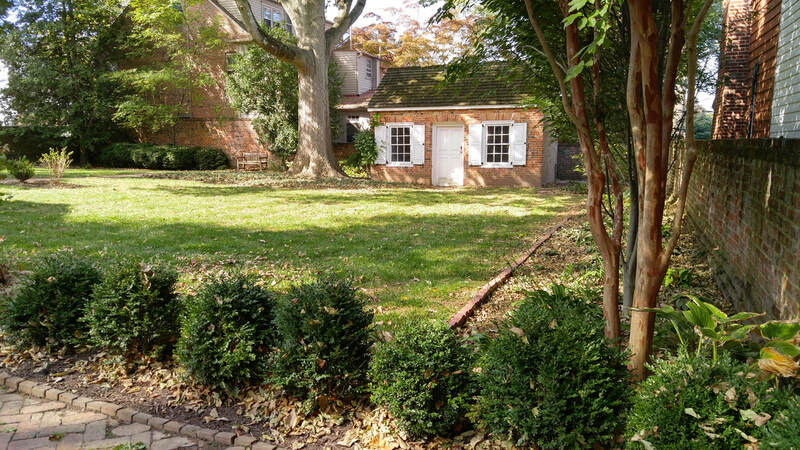 The sourwood or sorrel tree near the back entrance to the Amstel House is a slow-growing flowering tree native to Delaware that turns vibrant red in the fall. Sourwood honey is highly prized. Sourwood leaves have medicinal purposes and its flowers are used to make jellies. Pause here to imagine how different these gardens looked in the 1700s. Exit through the wooden door on Delaware Street, pausing to admire the original Gillette door and hardware.